← The First Stop to Landing your dream Job Leave the Country. It’s a tall order: Over the next few decades, the world will need to wean itself from dependence on fossil fuels and drastically reduce greenhouse gases. Current technology will take us only so far; major breakthroughs are required. What might those breakthroughs be? Here’s a look at five technologies that, if successful, could radically change the world energy picture. They present enormous opportunities. The ability to tap power from space, for instance, could jump-start whole new industries. Technology that can trap and store carbon dioxide from coal-fired plants would rejuvenate older ones. See the complete Energy report. Success isn’t assured, of course. The technologies present difficult engineering challenges, and some require big scientific leaps in lab-created materials or genetically modified plants. And innovations have to be delivered at a cost that doesn’t make energy much more expensive. If all of that can be done, any one of these technologies could be a game-changer. For more than three decades, visionaries have imagined tapping solar power where the sun always shines—in space. If we could place giant solar panels in orbit around the Earth, and beam even a fraction of the available energy back to Earth, they could deliver nonstop electricity to any place on the planet. Source: New Scientist Sunlight is reflected off giant orbiting mirrors to an array of photovoltaic cells; the light is converted to electricity and then changed into microwaves, which are beamed to earth. 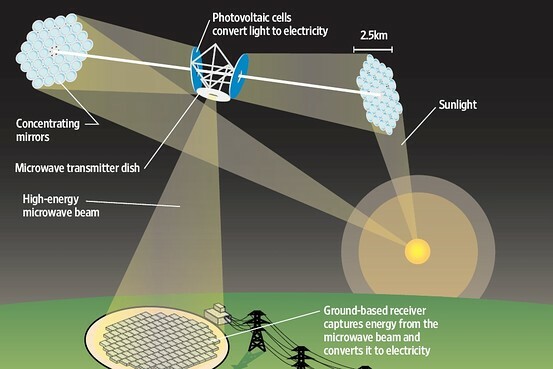 Ground-based antennas capture the microwave energy and convert it back to electricity, which is sent to the grid. The technology may sound like science fiction, but it’s simple: Solar panels in orbit about 22,000 miles up beam energy in the form of microwaves to earth, where it’s turned into electricity and plugged into the grid. (The low-powered beams are considered safe.) A ground receiving station a mile in diameter could deliver about 1,000 megawatts—enough to power on average about 1,000 U.S. homes. The cost of sending solar collectors into space is the biggest obstacle, so it’s necessary to design a system lightweight enough to require only a few launches. A handful of countries and companies aim to deliver space-based power as early as a decade from now. Electrifying vehicles could slash petroleum use and help clean the air (if electric power shifts to low-carbon fuels like wind or nuclear). But it’s going to take better batteries. 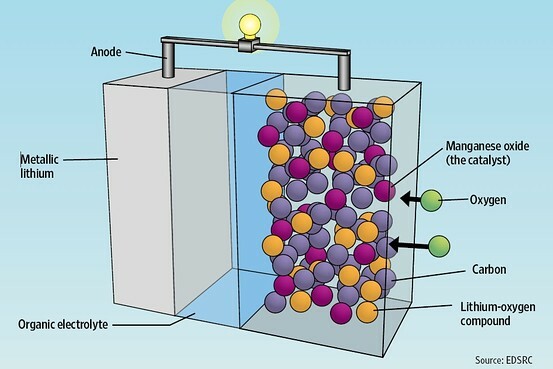 Source: EDSRC In a lithium-air battery, oxygen flows through a porous carbon cathode and combines with lithium ions from a lithium-metal anode in the presence of an electrolyte, producing an electric charge. The reaction is aided by a catalyst, such as manganese oxide, to improve capacity. Lithium-ion batteries, common in laptops, are favored for next-generation plug-in hybrids and electric vehicles. They’re more powerful than other auto batteries, but they’re expensive and still don’t go far on a charge; the Chevy Volt, a plug-in hybrid coming next year, can run about 40 miles on batteries alone. Ideally, electric cars will get closer to 400 miles on a charge. While improvements are possible, lithium-ion’s potential is limited. One alternative, lithium-air, promises 10 times the performance of lithium-ion batteries and could deliver about the same amount of energy, pound for pound, as gasoline. A lithium-air battery pulls oxygen from the air for its charge, so the device can be smaller and more lightweight. A handful of labs are working on the technology, but scientists think that without a breakthrough they could be a decade away from commercialization. Everybody’s rooting for wind and solar power. How could you not? But wind and solar are use-it-or-lose-it resources. To make any kind of difference, they need better storage. 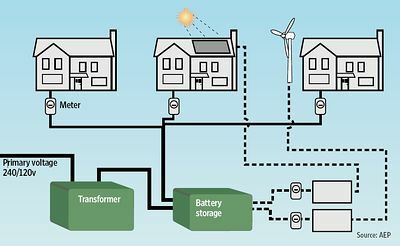 Source: AEP Battery packs located close to customers can store electricity from renewable wind or solar sources and supply power when the sun isn’t shining or the wind isn’t blowing. Energy is collected in the storage units and can be sent as needed directly to homes or businesses or out to the grid. Scientists are attacking the problem from a host of angles—all of which are still problematic. One, for instance, uses power produced when the wind is blowing to compress air in underground chambers; the air is fed into gas-fired turbines to make them run more efficiently. One of the obstacles: finding big, usable, underground caverns. Similarly, giant batteries can absorb wind energy for later use, but some existing technologies are expensive, and others aren’t very efficient. While researchers are looking at new materials to improve performance, giant technical leaps aren’t likely. Lithium-ion technology may hold the greatest promise for grid storage, where it doesn’t have as many limitations as for autos. As performance improves and prices come down, utilities could distribute small, powerful lithium-ion batteries around the edge of the grid, closer to customers. There, they could store excess power from renewables and help smooth small fluctuations in power, making the grid more efficient and reducing the need for backup fossil-fuel plants. And utilities can piggy-back on research efforts for vehicle batteries. Keeping coal as an abundant source of power means slashing the amount of carbon dioxide it produces. That could mean new, more efficient power plants. But trapping C02 from existing plants—about two billion tons a year—would be the real game-changer. 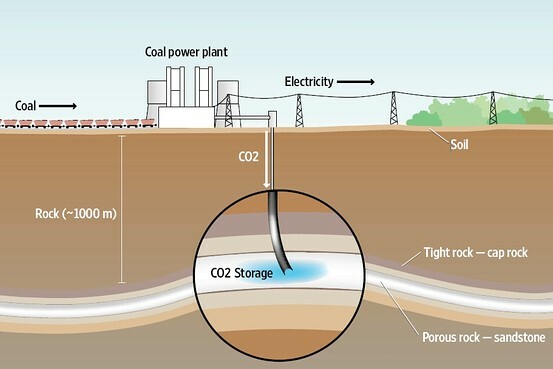 Source: Vattenfall Carbon dioxide is removed from smokestack gases and compressed. It’s then pumped deep underground and stored in porous rock formations. Techniques for modest-scale CO2 capture exist, but applying them to big power plants would reduce the plants’ output by a third and double the cost of producing power. So scientists are looking into experimental technologies that could cut emissions by 90% while limiting cost increases. Nearly all are in the early stages, and it’s too early to tell which method will win out. One promising technique burns coal and purified oxygen in the form of a metal oxide, rather than air; this produces an easier-to-capture concentrated stream of CO2 with little loss of plant efficiency. The technology has been demonstrated in small-scale pilots, and will be tried in a one-megawatt test plant next year. But it might not be ready for commercial use until 2020. One way to wean ourselves from oil is to come up with renewable sources of transportation fuel. That means a new generation of biofuels made from nonfood crops. Researchers are devising ways to turn lumber and crop wastes, garbage and inedible perennials like switchgrass into competitively priced fuels. 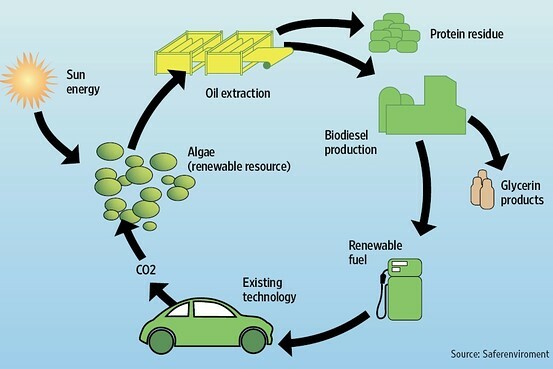 But the most promising next-generation biofuel comes from algae. Source: Saferenviroment Algae grow by taking in CO2, solar energy and other nutrients. They produce an oil that can be extracted and added into existing refining plants to make diesel, gasoline substitutes and other products. Algae grow fast, consume carbon dioxide and can generate more than 5,000 gallons a year per acre of biofuel, compared with 350 gallons a year for corn-based ethanol. Algae-based fuel can be added directly into existing refining and distribution systems; in theory, the U.S. could produce enough of it to meet all of the nation’s transportation needs. But it’s early. Dozens of companies have begun pilot projects and small-scale production. But producing algae biofuels in quantity means finding reliable sources of inexpensive nutrients and water, managing pathogens that could reduce yield, and developing and cultivating the most productive algae strains. One thousand megawatts are enough to power on average about one million U.S. homes. This article on space-based solar power incorrectly said 1,000 megawatts could power about 1,000 homes. — Mr. Totty is a news editor for The Journal Report in San Francisco. He can be reached at michael.totty@wsj.com .